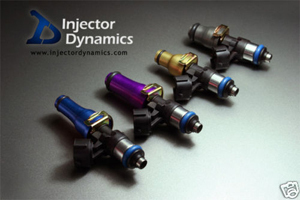 Injector Dynamics fuel injectors are the result of batch testing large quantities of specially modified fuel injectors, and then carefully matching them into sets based on their dynamic flow across the pulsewidth range. The result is vastly superior cylinder to cylinder consistency, even at very low pulsewidths. 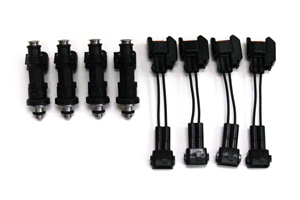 Each set of injectors is tightly matched and have the capability to run as much as 100psi base fuel pressure. All Injector Dynamics injectors are Saturated, high impedence in design so there is no need for injector drivers or injector resistor packs to prevent frying your expensive engine management systems. These injectors have superior atomization and a very narrow spray pattern which results in more power, better idle and better fuel efficiency. Unlike many injectors in the market today, these injectors have excellent low pulsewidth response with linearity within 2 percent. This has been proven and documented with pulsewidth of 2 milliseconds and injector response is predictable even at 1.5 milliseconds. The excellent response time of these injectors allow for extremely high injector duty cycle (IDC). No longer are your recommended IDC's capped at 85 percent. Injector Dynamics fuel injectors allow you to run 92.5 percent duty cycle at 9,000 rpm and up to 95 percent IDC at 6,000 rpm while maintaining linearity within 1 percent. 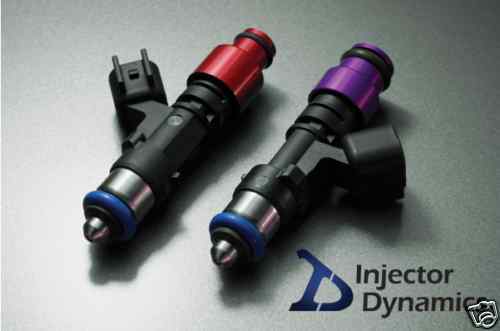 Choose Injector Dynamics fuel injectors and see why these injectors are soaring in popularity and the choice injector for high performance applications by an increasing number of tuners around the world.